The final stop on the Welsh part of our road trip was Abergavenny, on the edge of the Brecon Beacons. We had no clue what to expect there and were curious to find out. We parked at the local car park on the edge of the main shopping area – it was £1 for 2 hours, but on a market day it’s better to get the £1.50 ticket for 3 hours. 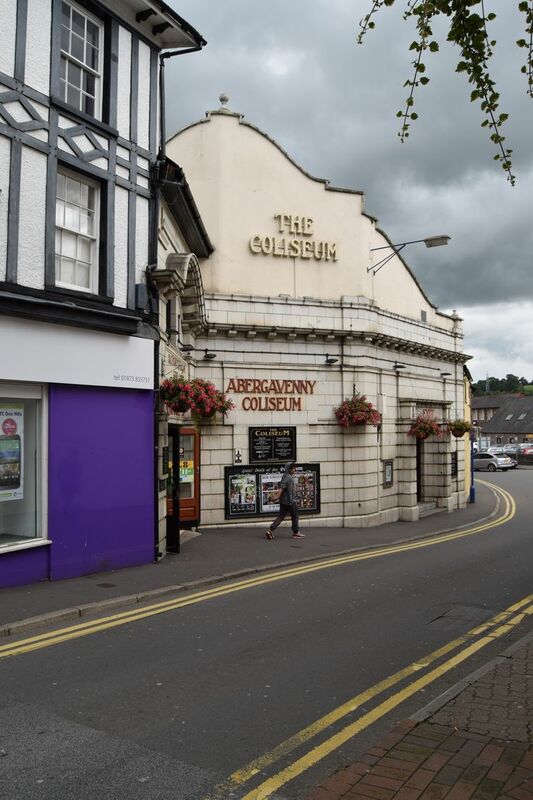 Abergavenny is an old-school sort of town and very down to earth. The central shopping precinct is a typical, functional concrete mid-20th century building with many high street names. However surrounding the precinct is where you will find more interesting shops and some interesting period buildings. Many of the buildings are in typical Welsh style with painted rendered walls – all of which add character to the town. The two buildings which stood out for me were the Abergavenny Baptist Church and Abergavenny Market Hall. Both buildings used dark rough-hewn stone and sandstone in their construction to create a distinctive look. The town was busy as the kids hadn’t gone back to school yet and the pavements and side streets are quite narrow so you end up walking in the road, trying to dodge traffic. The A40 runs through the heart of the town too so there is always plenty of traffic and you need to use the pedestrian crossings to navigate the town safely. First thing we did was to find food. We ended up at a little takeaway called the Codfather and had a generous portion of fish and chips - they were nice too. Then there was the mission to find the local toilets. I tried the local public toilets which weren’t great – lack of tissues and the overwhelming smell weren’t pleasant. However Neil on the other hand used the toilets in Nicholls department store which were much nicer. Obviously we were here to check out the charity shops and found plenty to choose from. As we were in Wales it wasn’t clear whether some were charity shops or just local independent shops. So I ended up being the Sherpa trying to suss out what was a charity shop and what wasn’t. 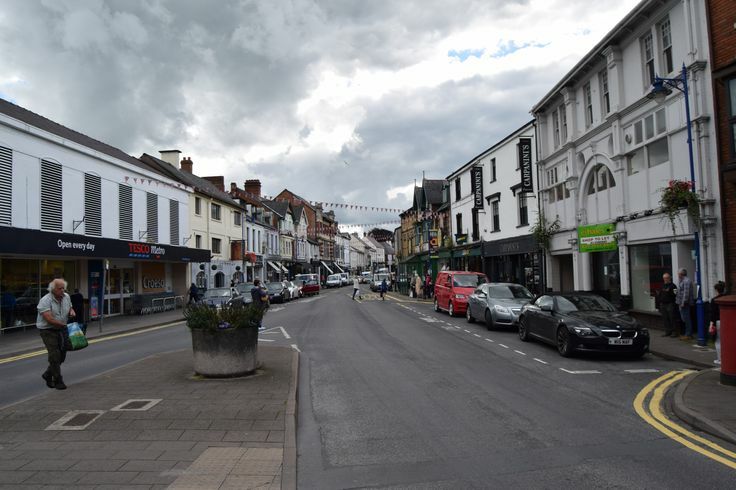 There are plenty of independent shops in Abergavenny, which was great to see. I did notice there were a number of empty shop units in the town and also there weren’t that many pubs either. The recession has clearly hit this place, but the independent trade is keeping it afloat. I found a few craft shops, which is always a joy for me. One shop specialised in fabric and I picked up a few pieces in their sale. There was a good wool shop too, but sadly I couldn’t buy anything as I can’t knit anymore. Neil found a house clearance shop, but the owners were impatiently waiting for Neil to finish browsing so they could shut up shop for lunch. It’s definitely worth popping in Nicholls, which is a classy independent department store. We’d seen one in Brecon and apparently they have a tiny chain of shops in South Wales. It’s quite a pleasant upmarket place and the café seemed to be full of families and ladies-who-lunch. 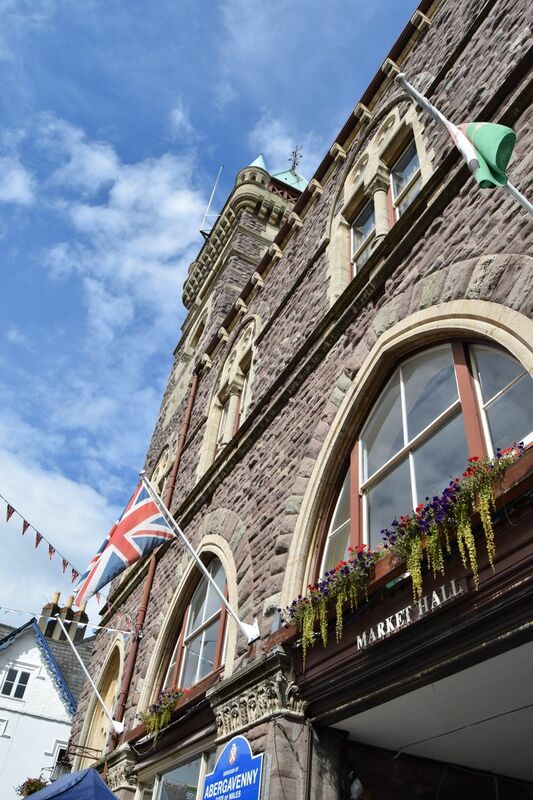 My favourite place was Abergavenny Market Hall as it was hosting the regular Wednesday flea market, which proved popular with the locals too. It reminded me of the Sunday flea markets you find in New York – jammed packed full of interesting and quirky stuff. 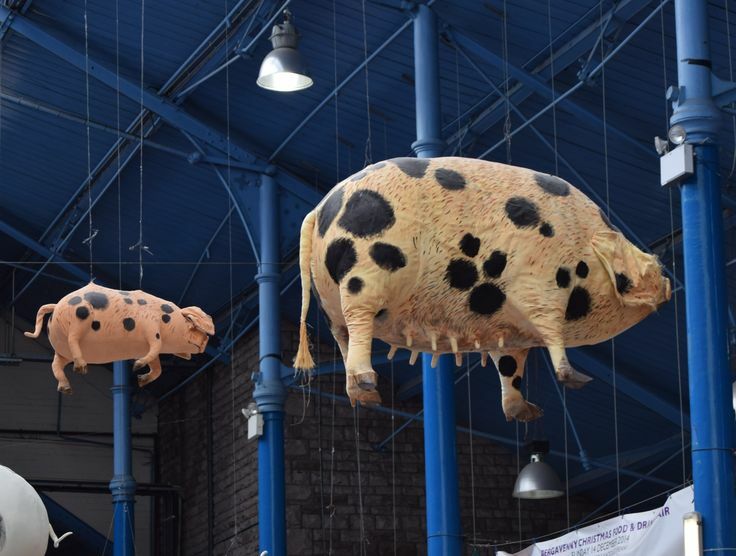 I loved the realistic looking flying pigs which were hanging above the stalls and I had to take a few pictures of them. Neil found some record stalls and picked up some nice 80s 7 inch singles. I didn’t pick up anything, although a couple of the locals were commenting on my camera. They have a wide range of different markets here over the month including a farmers, craft and antiques markets. If I lived near here I would definitely be visiting this place on a regular basis. We had only planned to stay in Abergavenny for a couple of hours, but now wished we’d spent a bit longer here. I really didn’t expect the place to be quite as interesting as it was, because it didn’t strike me as a tourist destination. Clearly the community likes to shop local and it’s great to see a place like this teeming with people. If we were ever in the vicinity again, I’d definitely pay another visit, particularly to the Market Hall.